It seems this team’s focus and purpose was to help Big Pharma find another synthetic creation they could patent for big bucks to inhibit resistant cancer cells’ ability to carry on and metastasize despite conventional therapies. This research team’s research was in vitro, which is test tube or petri dish analysis. But the breast cancer cells were cultured from actual breast cancer patients’ cancerous tissues. During their process of tracking what enzymes or proteins did what, they used vitamin D to reduce cathepsin L from cancer cells that refused to fold and quit. They had determined that increased cathepsin L invaded the cell’s nucleus and blocked 53 BPI, a protein that inhibits cancer cell growth. The 53 BPI protein flourished again when cathapsin L was reduced or eliminated, permitting this protein to resist the cancer cell’s growth. Note: Vitamin D was used to diminish the cancer cells’ cathepsin L.
It’s been recently discovered that 50 ng/ml or more provides much better disease prevention. From 80 to just under 100 ng/ml is recommended temporarily for therapeutic purposes. Getting vitamin D3 from sunlight exposure or UVB tanning bed exposure guarantees you won’t overdose vitamin D3. The body’s D3 manufacturing system shuts down when there’s enough. Bathing immediately after sun exposure may remove skin oils that initiate the body’s D3 manufacturing process. Wait longer or use soap only on unexposed skin. Vitamin D3 cholicalciferol gel capsules will boost your D3 levels when there is a lack of sunshine or no access to a UVB ray tanning bed. From 5,000-10,000 international units (iu) daily is recommended if your levels aren’t up to at least the 50 ng/ml mark. The threshold for vitamin D3 toxicity, which is unlikely but possible, is 100 ng/ml. That’s why looking into an inexpensive lab for the 25[OH]D test every six months or so would be wise. NaturalNews) The kitchen is the heart of my home. It’s the hub of the domestic wheel. Since it’s where the woodstove is, this time of year, it’s where everyone gathers. And, everything of any importance takes place there: meals get prepared, recipes shared, bills paid, horse grains mixed, tinctures made, messages exchanged; kombucha brewed, coffee sipped and books read. Sometimes I take for granted that the kitchen is the living heart of my home. That is, until someone reminds me. And, invariably, that reminder comes in the form of them telling me how “old fashioned” or “cozy” it is. I’ve got generations of memories of the kitchen being the command post of the home. My grandmother’s kitchen was alive with conversation, cookie baking and ironing. We did our homework in the kitchen while she stirred the soup kettle over the woodstove. There were knitting projects by the rocking chair in the corner and grandpa read his book at the kitchen table while dunking cookies in coffee. It’s not much different at my place. And, I forget that this is “old fashioned” or “cozy.” To me, it’s normal. Every now or then, a well intentioned friend tries to bring me up to speed by reminding me that most modern homes center around the TV or home entertainment center. Folks in these households gathers around the television to eat (if you can call the consumption of processed junk-foods eating), nap, and veg out. This sounds de-vitalizing to me. I get an impression of people who are eviscerated and socially alienated. My kitchen is vitalizing. People are animated and active. And, they are socially engaged with one another through lively conversation and shared projects. Things get done and company gets kept. Quality time isn’t scheduled – it just happens naturally. According to the Bureau of Labor Statistics LS American Time Use Survey (A.C. Nielsen Co.), American households spent 5 hours and eleven minutes per day watching TV. Compare that to the 0.55 minutes that, according to the same survey, people spend in their kitchens per day. That’s right. Americans spend less than one hour a day in the heart of their home: the place where food – the nutritional foundation of human fuel – is prepared. Americans spend more time engaged in passive distraction than active self-nourishment. My kitchen is where we cook and eat; stack firewood; hang culinary herbs to dry; make floral elixirs; grind flour; dry wool socks and mittens; grow sprouts; and visit. It’s the first place people head when they come in the house. And, it’s a commercial-and-propaganda-free-zone: nobody is extolling the virtues of sugary breakfast cereals, weight loss programs, or celebrity trivialities. I cleaned a horse bridle by the kitchen woodstove today. And, when I got it done, I hung it from the lamp so that everyone could look it over. I did yoga in the kitchen today – early in the morning before the press of activity took over. I read for a while in the kitchen this afternoon – after I had meditated by the woodstove while re-kindling a dwindling late-day fire. Maybe it’s because I don’t have a TV. Or, maybe it’s because my kitchen opens into all of the surrounding rooms. Or, maybe it’s because my kitchen is huge – like a healthy, fit heart that pumps vitality into the whole rest of the body. Whatever the reason, I want it stay this way. I want the kitchen to remain the living nerve-center of my life. I want it to remain the domestic command post, the hub of the household wheel. It feels right that the really important things in life – good food, good friends and good times – all take place there. I don’t want to come up to speed and be “modern.” I don’t want to lay on the couch and watch TV. I want to stir a soup kettle and make real, living memories. (NaturalNews) On the face of it, there is absolutely no sense to the idea that one million New York gun owners should be declared “guilty” because one crazy man went nuts in Connecticut and committed mass murder. Yet that’s the argument Gov. Cuomo used to rush through gun registration and confiscation legislation that’s now law in the state of New York. On this issue, New Yorkers have declared their line in the sand. One million New Yorkers own firearms, and relatively few of them plan to comply with Cuomo’s gun registration plans, knowing full well that registration is just the first step to forced confiscation. After all, why would the state of New York need to know who owns all the guns if it wasn’t planning to do something with that list? Throughout world history, gun registration lists have almost always become gun confiscation lists where governments go door to door with armed troops, demanding at gunpoint that people turn in the firearms they previously registered. 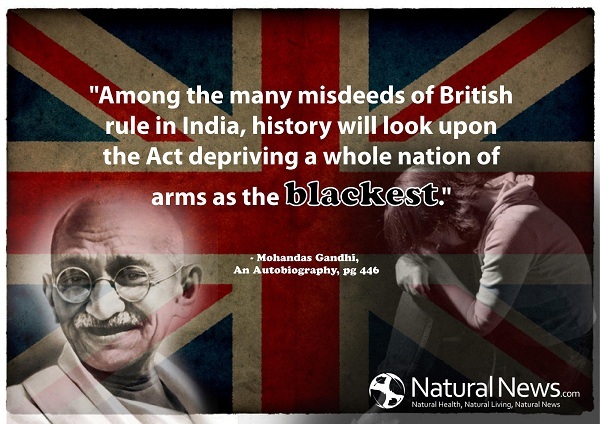 Gandhi is perhaps best known as a pacifist who helped stage mass civil disobedience in the face of the imperial occupation of his nation by enemy forces (the British). But what is not well known is that Gandhi was only a pacifist because his people had been disarmed by the occupying British military. Had Gandhi’s countrymen possessed arms, they would have fought back against the British empire’s illegal and imperial occupation many years earlier. “I do believe that where there is only a choice between cowardice and violence I would advise violence,” Gandhi wrote in his famous work, Doctrine of the Sword. I advocate training in arms for those who believe in the method of violence. I would rather have India resort to arms in order to defend her honor than that she should in a cowardly manner become or remain a helpless witness to her own dishonor. Never heard these quotes from Gandhi? That’s because you’ve been taught a false history on Gandhi and most other topics. Martin Luther King, for example, also possessed many weapons for self defense and even sought a concealed carry permit to help protect himself from violence. By “going Gandhi” with mass civil disobedience, New Yorkers are following in the footsteps of human history’s greatest freedom fighters and human rights activists. Self defense is a fundamental human right, and any who try to take this right from the People are, by definition, oppressors of human freedom and civil liberties. Will New York police fire on their own neighbors and relatives? Now the question becomes this: Will law enforcement officials across New York now wage an actual shooting war with private gun owners who refuse to comply with an illegal, unconstitutional and immoral law hastily passed by Cuomo and other enemies of America? If so, New York police, state troopers and other law enforcement officials should expect to take considerable casualties as they attempt to disarm the citizenry. As has been written about in many places across the internet, including in articles by firearms instructor Paul Howe, any members of law enforcement who engage in armed raids against the homes of gun owners will likely see their own homes and families targeted with retaliation. Yes, we are talking about the potential of a New York guerilla war where those who participate in gun confiscation are put on “fair game” lists to be targeted and taken out. This is what is being discussed across the ‘net, on blogs, in personal conversations, on radio shows and elsewhere. Cuomo has crossed that line, and although for the record I do not advocate the use of violence to resolve conflicts, I cannot help but admit that Cuomo may very well be placing his own life, the life of his family members, and the lives of his staffers in imminent danger if he does not reverse his decision. What’s brewing right now is a kind of civil war in New York, and there are apparently all kinds of gun owners across the state who are prepared to die rather than register their firearms. For this reason, and because I do not wish to see any violence occur over this issue, Cuomo needs to immediately back down and reverse his gun registration law in order to prevent bloodshed. Yes, it has come to this. And while I do believe that gun owners in New York and across America are incredibly tolerant, patient and even humble people, when they are blatantly placed in the crosshairs of the threat of government violence against them if they do not comply with unreasonable, unconstitutional and immoral demands, they can and will become Cuomo’s worst nightmare. There are one million gun owners in New York. If one percent rise up and decide to fight back against tyranny, Cuomo will be facing a force of 10,000 armed civilians rising up against him. How do you stop 10,000 armed, angry civilians from marching on the state capitol? You don’t. If these 10,000 people decide to pick up arms and march for their rights and freedoms, they will win the showdown. The only way New York gun owners lose is if they lay down their arms voluntarily and submit to Cuomo’s unconstitutional mandates. Then again, any person who lays down his arms in the face of tyranny probably doesn’t deserve to be an American in the first place. This nation was founded on the courage of strong-willing men and women who were willing to take a stand for liberty and justice. That spirit of America appears to be rising again in New York, and Cuomo seems to be on a collision course with history in the making… the kind of history that results in great loss of life followed by a backlash of the People against out-of-control government oppression. Ultimately, one possible outcome of all this is Cuomo being forced to flee New York and seek refuge in another state (or another country), where he will no doubt face extradition charges to bring him back to New York where he can be tried for his crimes against the people of the great state of New York. (NaturalNews) In a lengthy piece recently, I documented how fear-mongering by the nation’s political elite has allowed them to foist a raft of unconstitutional regulations and legislation over the years on a nation that, undoubtedly, our founding fathers would likely never recognize (unless they were comparing modern-day America to latter-day England). One of the latest justifications for the imposition of many of these onerous new rules is the ever-present threat of terrorism, a fallacy of fear that was on full display in Miami Jan. 20. According to reports, renowned photographer Carlos Miller, who runs the website Photography Is Not a Crime, and a companion were roughed up, detained and eventually fined by Miami-Dade Metrorail security guards for taking pictures of a historical public building. Miller and his friend were passing time while waiting for a Metrorail by taking photos of the Dade County Courthouse, which was built during the Roaring 20s and is considered to be a stunning piece of architecture. “Then considered one of the more monumental structures in Florida, Dade County’s 27-story Neoclassical-style courthouse was begun in 1925,” says this historical account of the structure. Suddenly, a voice blared over a loudspeaker ordering them to cease and desist with the photographs. The pair ignored the order, but shortly thereafter a 50 State security guard came onto the platform and confronted them. Miller sensed that his civil rights were about to be violated once more, he asked his companion to begin videotaping the exchange. Following a short exchange, the guard accused Miller of being intoxicated; two more guards approached then approached him and sort of began to crowd him towards the elevator. A scuffle began next, during which time the camera Miller’s friend was using was knocked free and turned off. “At the top of the escalator, one of them shoved me hard as if to push me down the escalator, which is when I shoved back,” said Miller in a blog post on his site. Miller and his friend were eventually cuffed and held until Miami-Dade Police officers arrived. The photographer activist said police instantly recognized him from his website and from previous incidents. The men were held for about an hour and were then released, having been issued a $100 citation that accused them of “producing loud or excessive noise” – though neither man was cited for anything having to do with illegally photographing anything. In fact, guards returned both cameras to them without erasing the photos or otherwise tampering with them. Miller followed up the raw footage of his detainment and arrest with another video showing the injuries he received from the incident. One final fact: Miller is already involved in a state lawsuit following a previous incident with 50 State guards. He says he may now escalate that suit into a federal case. Welcome to America, circa 2013, where fear and loathing is the new normal and rules and regulations ostensibly aimed at “keeping you safe” are devoid of common sense and constitutionalism.